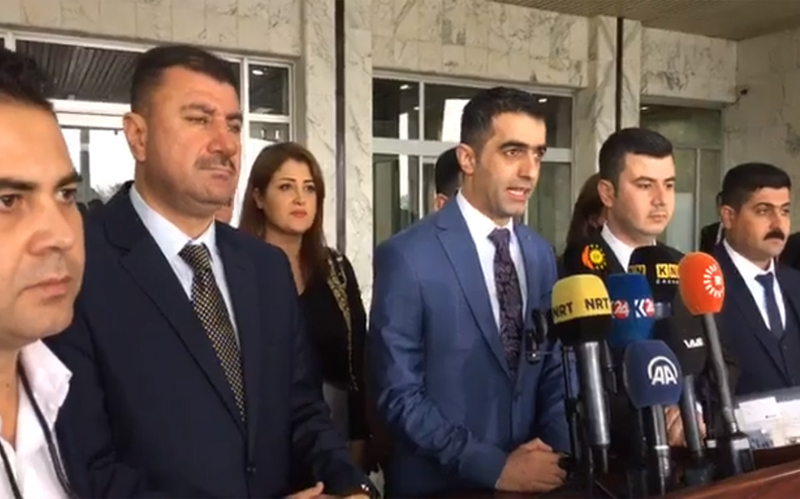 The Change Movement bloc in the new Kurdistan Parliament unveiled the road map for its parliamentary work and its attempt to create serious understandings among the blocs, announcing the goal of their participation in the new government. This came during a press conference held by the Change Block recently and was attended by the members of the bloc in the new session of the Parliament of Kurdistan, where Mr. Ali Hama Salih stressed that the movement of change is going on in its reform program and in the same spirit, whether in government or in opposition, in order to find a radical solution to the current crisis In the Kurdistan Region. He pointed out that the priorities of the bloc of change is to work to end the financial crisis and make the oil sector an institutional sector. The integration of the Peshmerga forces and the establishment of common understandings with the forces of interest to the general public interests and work together to pass this stage. In response to a reporter's question, the member of the Change Bloc stressed that his bloc in the event of its participation in the government aims to lift the region out of its crisis, but if it chooses the opposition side, it strives with the same spirit to end the status quo. "On the participation of the movement of change in the government or not, we have many channels on which we are based to make a decision in this regard and from those channels members of the Change Block will hold meetings in this regard and express our views, and the movement of change depends on the referendum and exchange of views." He added.